​Do puppies need other vaccinations and when? vaccinations is simple, dogs can do die as a result getting them. strengthened our belief towards not giving dogs any drugs or vaccinations unless in dire situation. a very bad reaction to it too. Luckily the puppy didn't die like our mother dog did. with so our risks are very slight for them to catch anything. will be exposed to other dogs ​and animals it will be your choice as well. Below is all the information for you to make an informed choice. Puppies need vaccinations to help prevent the catching of various dangerous diseases. Vaccines contain antigens, which your dog’s immune system thinks are the organisms that cause these diseases. disease ​they have been vaccinated against, his immune system will know how to destroy it. What Diseases Can Vaccinations Protect Against? able to recommend those they think you really need, with others being up to your choice. variables, mostly the prevalence or absence of a disease in your area. live your dog will need to have a booster once every one to three years. inoculating against it is so important. hepatitis and can’t be passed to people, it’s still very serious. Before vaccination, this was a big killer of dogs. Now it’s only commonly found in the wild and in pet stores. Vaccinating against this disease will protect your puppy if he comes in contact with the virus while out and about. at boarding kennels, doggy daycare or dog shows. have a large death rate, so not all vets recommend it. might need a booster every six months. of passing these parasites to other animals. ​4 and 10 weeks in high risk environments for distemper. Most vaccines are given as injections. These are given either under the skin or into the muscle. However, some vaccines, such as those against kennel cough, work better when given as a spray up your puppy’s nose. Most vets offer a combined injection so your puppy doesn’t need to have numerous jabs. This will protect against the core diseases, plus a number of others, depending on the vet’s advice. Most combination injections protect against distemper, leptospirosis, hepatitis, parainfluenza, coronavirus and parvovirus. for him to go on the ground outside, except for in your own yard. 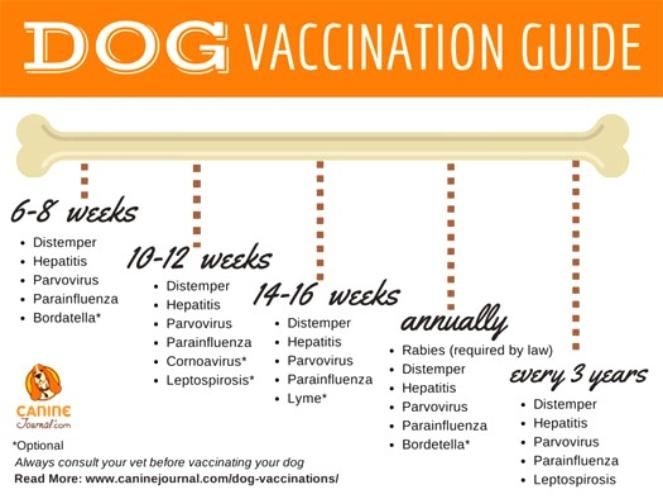 ​able to sort out a modified schedule if your pup is older than 7 weeks and hasn’t had his first injection. This is when your puppy should get his first combination injection. At this age, your puppy will probably be in your care. He needs his second combination vaccine. Make sure you have a record of his first injection to show your new vet. have a Lyme disease vaccine. between the ages of 12 and 16 weeks. will advise you when your puppy can go out for his first walk. ​Are There Any Risks Involved? Unfortunately, there are potential risks to having your puppy vaccinated. That said, many people believe the risks are far outweighed by the benefits. shouldn’t be vaccinated at all, but that they don’t need annual boosters. means more money for them! Most vets concede it’s likely vaccinations are effective for more than one year, just as they are for humans. ​believe this is too much of a risk and still recommend annual boosters. have to be prepared for when bringing a puppy home. seem wise, it’s more important to choose a vet with an excellent reputation. one rabies vaccination. If your vet recommends any other vaccinations, this will be extra. 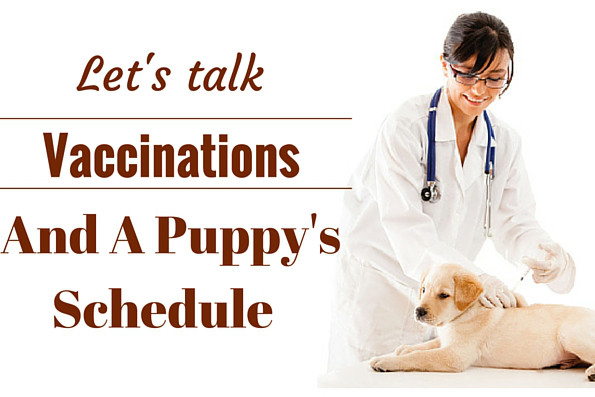 There’s a lot to think about when it comes to puppy vaccinations, but don’t let it overwhelm you! ​risk of Lyme disease in your area, your vet will be able to advise you. We will end this section the same way we started it.